We offer Indoor Commercial High Bay Fitting. Thus our entire range is manufactured in strict compliance with the latest technological advancements in the market. We are engaged in offering a wide assortment of Light Fittings to our clients which are manufactured using high quality material. These are specifically designed depending upon the requirements of the clients. Further, these are offered at market leading prices. L xW xH : Cat. Ref. These Earth Embedded Cosme lights are installed along road side to illuminate the area. Our lights are compact in size and can be installed easily. 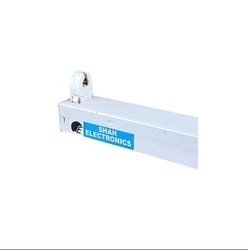 Moreover, these lights are offered to the customers in different watts, which meet their requirements. Being a leading trader of the industry, we offer a diverse compendium of surface down light fittings. The fittings are manufactured by reliable manufacturers of the industry using premium quality material. Therefore, our range is widely acknowledged by clients due to its durability, safety, reliability and quality.